You can reference common HTML elements on this page. View the HTML and how it looks, and try it out in the challenge below. For more info on each element, click the links to Mozilla's HTML documentation. See HTML in 21 minutes for a full tutorial. The main page content goes in-between the <body> tags. Use h tags to create headings, with a number from 1 to 6 to specify heading level. To emphasize text, use <em> or <i>. For more emphasis, use <strong> or <b>. To insert comments in HTML that don't get displayed in the browser, use . There are 2 kinds of lists - ordered, numbered lists, which use <ol> tags for the list element, and unordered, bulleted lists, which use <ul> tags. They both use <li> tags to mark each list item. Links are created with the <a> tag. External Link Google Remember to include 'http' in URL when linking to external page. email link <a href="mailto:[email protected]">Email Someone</a> Email Someone Email links open in user's default email program. Link to location on page <a href="#lists"> Lists Links to elements on page with that id. Images are created with the <img> tag. Specify the image by setting the src attribute to the URL of the image. 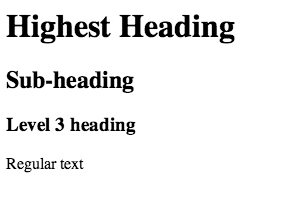 HTML elements can also have title attributes, which is associated text that is shown when the item is hovered over. The <p> tag is used for paragraphs of text. A paragraph is a block-level element, which means a newline appears before and after it. To add a single new-line, use a single <br> tag. It shouldn't be used just to increase spacing. To add a horizontal line on the page (for a thematic break), use a single <hr> tag. To include newlines and extra spaces, use the <pre> tag. This will usually show everything in a monospaced font. <table></table> - marks the entire table. <tr></tr> - marks each table row. <td></td> - marks each cell in a row. The wizard by the bridge wrote an article on his typewriter, and he would like you to convert it to HTML. Create the appropriate HTML table and lists to replace his his typewritten ones.